Judaism: India is the only country in the world where there has never been an indigenous anti-Semitism. Jews have flourished in India perhaps for 2,000 years, although only around 6,000 remain today. Indian Jews have been Prime Ministers to the Maharajas, the tutor to the Crown Prince of the Mughals, fabulously wealthy industrialists, international spice merchants, modern India's greatest war hero, film moguls and movie stars, celebrated poets, playwrights, Kabbalists and mystics, an environmentalist zookeeper, medical researchers, a concert violinist and the Court Jeweler to the Nawab of Oudh. Indian Judaism developed creatively. Indian Jews have been learned and pious, leaving a body of religious poetry, folk songs, legal and mystical treatises, and some of the most striking synagogues in the world. My personal story is when I had gone to Kolkata to research our tours about Judaic Tour of India, and I had wanted to meet and talk to some Jews in Kolkata. None were available and the next best thing was to visit two of the historically five Synagogues (three were closed because of the reduced population). So this old man met us with a bunch of keys and opened the Synagogue for us. Lovely place. Then I asked if I could see the Torahs. He took another set of keys and we were in the sanctum-sanctorum and I was able to handle the Torahs. I asked if we could see the other Synagogue, and the whole exercise was repeated at the second Synagogue. I asked this man if he was a Jew. He laughed, and replied in Hindi, "No, I am a Muslim". Hold on, I said, but Muslims and Jews are fighting in the Middle East. Another smile, and I hear profound words: "Sahib, this is India!" There have been three major Jewish communities in India. The Cochin Jews date themselves from the destruction of the Temple in 72 CE. From the eleventh century, they lived as an autonomous community of agriculturalists, spice merchants, shipbuilders and soldiers. The 1568 Cochin Synagogue is not only the most famous in India, it is the oldest in the British Commonwealth and one of the most beautiful in the world. Nowhere else has Jewish culture flourished so long in freedom than here. Their unique tradition blends indigenous Jewish Malabari with Sephardic, Yemeni and Iraqi elements. 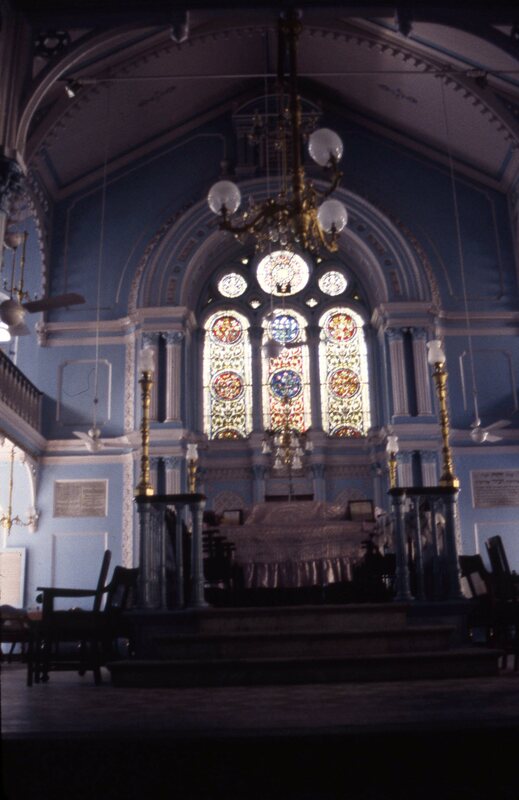 The Bene Israel of Bombay and the Konkan Coast were "lost" Jews who were recognized as Jews by either the 12th century David Rahabi, merchant brother of Maimonides, or the 18th century David Ezekiel Rahabi of Cochin's preeminent merchant house (according to Bene Israel and Cochini traditions, respectively). Their "religious evolution," from an anonymous group of rural oil-pressers into an accepted group in world Jewry, is miraculous and inspiring. They have been prominent in the arts, professions and government service not only in Bombay, where the great majority live, but throughout India. They built synagogues in Ahmedabad, Pune and Delhi, too - all of which we'll visit. The "Baghdadi" Jews were middle eastern merchants, many Iraqi but many also Syrian, Turkish and Persian, who came to India about the same time as did the British. They flourished, and left when the British left - for the most part. But they left their marks, in Calcutta and Pune, but most of all in Bombay, where they built schools, hospitals, libraries, monuments, synagogues, docks and factories. They also left a sense of romance. In east India in the States of Manipur and Mizoram exists a community called the Manipur Jews which sees itself as descendants of the Manasseh (Menashe) Tribe (one of the 10 lost tribes of Jews). Among the Manipur Jews there are some who believe that all the Manipur and Mizoram residents (about 2 million people) are originally from the Menashe tribe. Rabbi Eliyahu Avichail visited India several times. During one of his visits (in 1979) he named this community Bnei Menashe because the community’s Mizo ancestor had the name Manmasi, which could possibly be the same as Menassah son of Joseph. In 2005 Chief Rabbi Shlomo Amar, one of Israel’s two chief rabbis, recognized the Bnei Menashe community as descendants of one of the lost tribes of Israel. The Bnei Menashe relate their history of exile from the Northern Kingdom of Israel in 721 B.C. across the silk route finally ending up in India and Myanmar. Their oral history, passed down 2,700 years, describes their escape from slavery in Assyria to Media/Persia. From there they moved on to Afghanistan, and traveled toward Hindu-Kush on to Tibet, then to Kaifeng, reaching the Chinese city around 240 B.C.E. The Bnei Menashe believe that while in China their ancestors were enslaved yet again. These events caused the Israelites to flee and live in caves, with different groups going in various directions: Some down the Mekong River into Vietnam, the Philippines, Siam, Thailand and Malaysia, while some of the Israelites moved to Burma and, in this case, some west to east India (Manipur). These people have Chinese appearance and believe that Christian missionaries in the 19th century forced them to abolish their Jewish identity and adopt Christianity. Known as the "Children of Menmasseh", the majority of them are believed to be Messianic Jews (believers in Jesus Christ -- Yeshua). Today, some people refer to these people as "Shinlung" the "cave dwellers." These “Manipur Jews” have established a number of synagogues and have gained thousands of converts. Is this a major historical and demographic period? See the BBC article. Who Are the Jews of India?, by Nathan Katz (Univ. of California Press, 2000). The Last Jews of Cochin: Jewish identity in Hindu India, by Nathan Katz and Ellen S. Goldberg (Univ. of South Carolina Press, 1993). Three Jewish Communities of India: Identity in a Colonial Era, by Joan G. Roland (Transaction Press, 1998). The Jews of India: A Story of Three Communities, ed. by Orpa Slapak (The Israel Museum, 1885). India's Bene Israel: A Comprehensive Study and Soucebook, by Shirley Berry Isenberg (Judah L. Magnes Museum & Popular Prakashan, 1988). The Jew in the Lotus, by Rodger Kamenetz (Harper San Francisco, 1994).